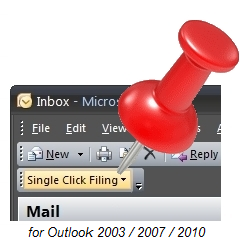 “Single Click Filing for Outlook” is a quick way to get email organized in Microsoft Outlook. Tap a key and an email goes to the right folder. In this $10 program, the backspace key is the most heavily used. It sends email to your favorite folder. Other shortcut keys move mail to other folders. If you forget what’s where, you can look at the top of the screen, where each folder has its own button. You can also change the names of those buttons and folders. Get more info about this utility at www.singlefileclicking.com. If you’re primarily a Gmail user like us, there are all kinds of similar shortcuts for filing email. Google the words: “Gmail shortcuts” to find a list of choices. If you use Yahoo, AOL or Hotmail, do a Google search for their shortcuts.